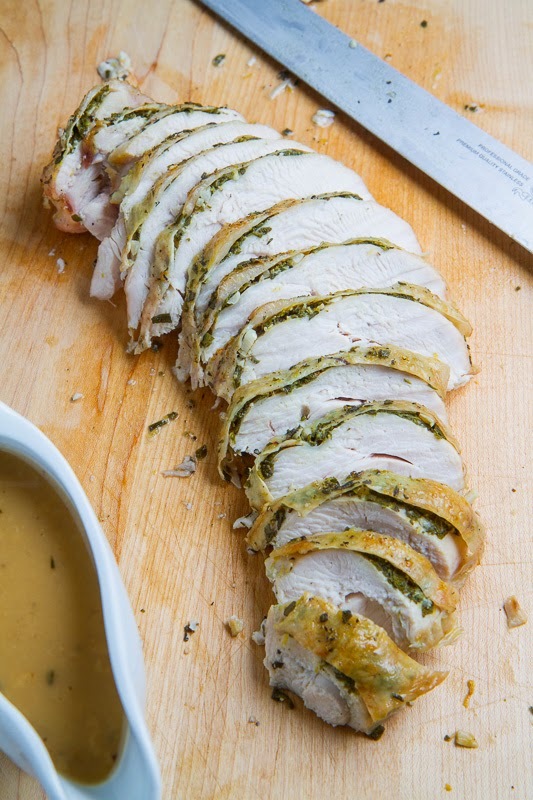 A simple herb roasted turkey breast that makes a great Thanksgiving meal for a small gathering. For me the center piece of the Thanksgiving dinner is definitely the turkey. Because I am not usually cooking for a huge family I generally find it easier to just get a turkey breast rather than a whole turkey. Turkey breasts can come quite large with the one that I got this time weighing in at 6 pounds without any bones so you can easily feed a small family with just one. Although I sometimes miss not having the whole carcass to use to make turkey stock I definitely enjoy using the leftovers that I do get to make turkey sandwiches with cranberry sauce . Since I knew that I would be going a bit overboard with one of the side dishes this year, I decided to keep things simple and I went with a herb roasted turkey breast with some sage, rosemary and thyme. When you are roasting a turkey you simply cannot let those pan drippings go to waste as they make for a really tasty gravy! Just like Thanksgiving would not be the same without turkey, the turkey would not be the same without some cranberry sauce and this year I went with a gingered cranberry sauce . For the carb side, I went with some creamy blue cheese mashed potatoes topped with caramelized onions and mushrooms and for the green side, I went with some brussels sprouts with bacon and lemon . This years turkey dinner was a huge success! Using your fingers separate the skin from the turkey breast leaving one side attached. Mix the oil, garlic, sage, thyme, rosemary, salt and pepper, rub the mixture all over turkey under the skin and brush the top of the skin with oil. Place the turkey in a stove top safe roasting pan, roast in a preheated 400F/200C oven for 30 minutes, reduce the temperature to 325F/170C and roast until the middle of the turkey reaches 160F, about 1 hour. Place the turkey on a cutting board, cover loosely with foil and let it rest for a 10 minutes before slicing. Meanwhile, place the roasting pan on the stove over medium heat, add the chicken stock and flour and simmer, while scraping the brown bits from the bottom with a wooden spoon, until the gravy thickens and season with salt and pepper. 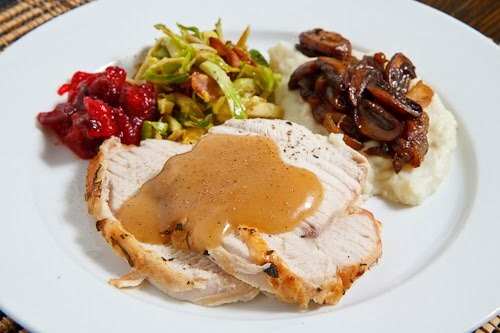 i'm not a huge fan of turkey by itself, but i absolutely love, love, LOVE it with cranberry sauce! Oh my goodness, this looks DELISH!!!!!!! Just beautiful. I bet it taste unbelievable! You just got me excited for Thanksgiving– yummy! I'm so excited to see other bloggers Thanksgiving foods – I've never celebrated that tradition before as I'm not American. Your meal sounds fantastic! And those potatoes? So gourmet with the cheese! looks elegant and delish like a satisfying dinner plate, little bit of this and little bit of that! A perfect Thanksgiving dish! That is the kind of thing I eat at Xmas. I think simple, at least when it comes to the turkey, is always better. All you need is something hearty and tasty and you've definitely got that here. What's your secret to a juicy turkey? Unos filetes muy ricos, me encanta esta receta. Your photography is so gorgeous! This recipe will be great for when we don't want to have a whole turkey. this looks wonderful, I'm going to try it this weekend! I needed a good recipes for turkey breasts, I've been doing pretty good with the turkey legs. I have a small family so with a whole turkey a lot is leftover! What a delicious sounding turkey!!! Looks beautiful too! Great shot of that turkey, Kevin! Seeing all of these turkeys north of the border this week have done me in. I'm going to have to smoke one this weekend. Thanks so much for re-posting these recipes. I just bought a turkey breast and needed a plan for it. I really enjoy your blog. Thanks for all your efforts and for sharing them with the rest of us foodies.